This is an add-on for the floppy version of Wing Commander 2. It adds digitized speech to all space combat communications and to a few cinematic sequences. In 1991, sound cards were still considered something of a luxury commodity, and most gamers were content with the beeps coming out of their PC box. 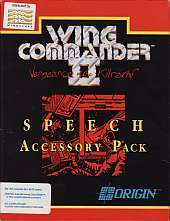 However, all it took was one session with a fully-speech enabled Wing Commander 2 to sell Sound Blasters by the dozen. At the time, the level of immersion it added to the game was entirely unparallelled. More than any other single thing, Origin's adoption of the Sound Blaster for speech in Ultima 7 and, especially, Wing Commander 2 is what brought about Creative Lab's still unbroken reign over the personal sound card industry.